As we all know, social media success should never be benchmarked purely on the number of fans and followers that you have. But that doesn’t mean that it’s not fun to sometimes line up a load of brands and judge them based on their popularity among consumers. We’ve done it before with fashion retailers, and this time it’s the turn of travel companies and airlines. It turns out that Dutch airline KLM is the most consistent brand across the board, coming first, second, third and fourth on Facebook, Twitter, Google+ and Pinterest respectively. It’s also the only travel company to feature in each top 10. The results come from a report published by eDigitalResearch that evaluated the social media presence of travel brands between December 9 and 15 2013. 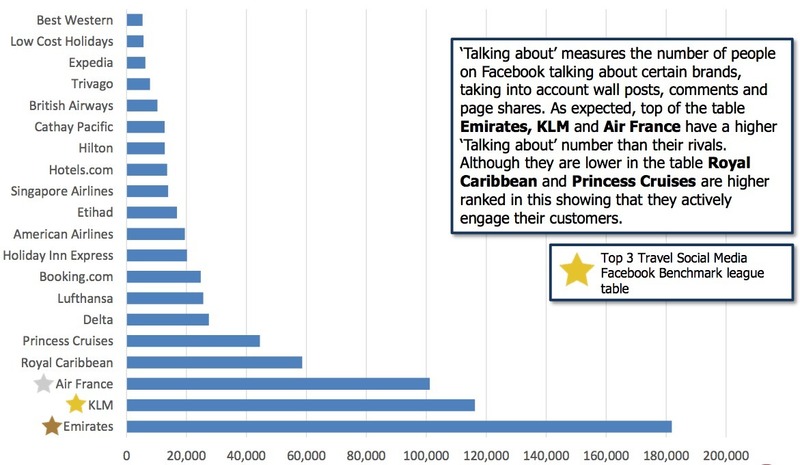 KLM tops the Facebook chart with just over 4.5m fans, followed by Air France (2.8m) and Emirates (2.3m). The fact that airlines inhabit the top three spots is put down to their large international customer base. The report also looks at engagement levels of these brands based in part on the ‘talking about’ data found on brand pages. It found that, based solely on ‘talking about’ numbers, Emirates jumps to the top spot with KLM second and Air France third. KLM’s success on Facebook is attributed in part to the fact that it responds to questions in the customer’s native language. It also has a number of useful apps, such as the Flight Status app that allows users to track flights in real time. American Airlines has managed to usurp KLM on the Twitter list with 684,000 followers compared to 669,000 for its rival. Delta rounds out an all-airline top three with 558,000 followers. As with its Facebook page, KLM uses Twitter as a customer service tool and updates its header image with the expected response time throughout the day. It also responds to customers in ten languages, meaning that the brand is accessible to customers across the globe. Google+ allows users to either +1 or follow brands, but for this study eDigitalResearch focused on the latter as a measurement of popularity. British Airways came top of the league with 2.4m followers, followed by Expedia (1.92m) and KLM (1.90m). As we saw with retail brands, there is a huge difference between those brands at the top of the table compared to those at the bottom. This is a reflection of G+’s failure to properly capture the imagination of both brands and consumers. British Airways maintains user interest by updating its page everyday with photographs and videos, however it’s not uncommon for major consumer brands to leave their G+ profile dormant for extended periods or totally ignore them altogether. 2030: have email and social destroyed the art of letter writing? Imagine it’s 2030, that’s 16 years from now, not half past eight in the evening, clever guy. You sit down to write a letter with your futuristic ray gun pen. But wait, haven’t the postal service just announced hover ships are no longer delivering sealed missives? Have postal bods stop delivering the letter (the last mile at least)? How have letter volumes changed alongside email and social messaging? How has click and collect affected courier services? Could Amazon be ruling parcel mail? There are indeed lots of questions. Well, it’s the New Year and I think it’s time for a literature study, this time looking at the humble letter. After all, I have previously delighted and enthralled my colleagues, collecting tens of page impressions by writing about the fax machine. So why not pen and paper? I’ve been tracing the history of letter writing in numbers alongside the rise of email and social. Are we close to the end of the letter and triumph of online?